We roll out the red carpet at beautiful Strömstad Spa & Resort! Hollywood Movie Star and Action man Alain Moussi is in town 8th to 12th of August for The Summer Camp and the Scandinavian premiere of his latest movie Kickboxer: Retaliation. Alain Moussi plays the lead role of Kurt Sloane in the reboot of the Kickboxer trilogy; a role that was originally played by Jean-Claude Van Damme who portrays his mentor in the film. 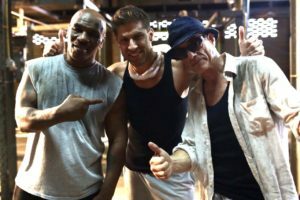 In the latest installment Kurt Sloan finds himself drugged and taken to a prison in Thailand, a country he swore never to return to after the events in «Kickboxer: Vengeance», where he is forced to fight his way to freedom under the guidance of some unexpected mentors. In addition to Moussi and the legendary Van Damme, the all star cast includes Christopher Lambert and Mike Tyson. The premiere party will be taking place on Friday August 10th and is an event not to be missed! An action packed introduction will kick off the evening followed by the opportunity to capture that Hollywood feeling forever with esteemed Canadian photographer Stephen Rasmussen (www.stephenrasmussen.com) flying in from Madrid for this once-in-a-lifetime event. Having trained in Jujitsu and Kickboxing, Moussi has more than 30 films under his belt as an actor and stunt man, and has famously doubled for the likes of Travis Fimmel (Warcraft), Hugh Jackman (X-Men: Apocalypse), Jai Courtney (SUICIDE SQUAD) and Henry Cavill (IMMORTALS). He will be teaching Jujitsu and Kickboxing at The Summer Camp, an annual training camp held at Källviken Semesterby in Strömstad. This amazing camp attracts instructors from all over the world to teach some of Scandinavia’s finest martial artists. Alain Moussi will be a draw card this year and will join the likes of champion kickboxer Jörgen Kruth, World stick fighting champion and Filipino Martial Arts Grand Master Johan Skålberg among others (www.TheSummerCamp.no). Doors open at 18:00 / 18 yrs + / Dress code: Cocktail. Sesongstart 15. augustBli med du også!